In March 2012 These Automatic Changers injected a shot of adrenaline into the veins of New Zealand music with the release of their latest single, "One Fifty Six". To celebrate its release These Automatic Changers are taking to the merciless highway. 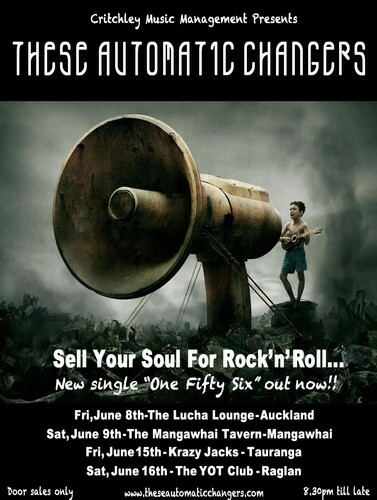 Their mission is to bring rock 'n' roll to Kiwis as they sell their "soul just for rock n rock". "Awesome. Seen them twice now and they blow everyone off the stage. They're even better live than I'd have imagined and I've seen a lot of acts in my time. The drummer and bassist are freakin amazing and damn, what a voice. They should be playing massive arenas - get them on that stage! Awesome."